Switches in electronics are referred to by names that indicate how the switching action is controlled. You see some of the many different types of switches in this figure. 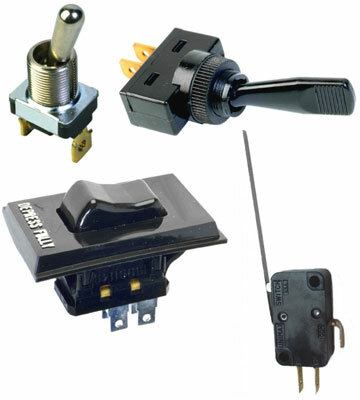 From top to bottom: two toggle switches, a rocker switch, and a leaf switch. Slide switch: You slide a knob back and forth to open and close this type of switch, which you find on many flashlights. Toggle switch: You flip a lever one way to close the switch and the other way to open the switch. You may see labels on these switches: on for the closed position, and off for the open position. Rocker switch: You press one side of the switch down to open the switch, and the other side of the switch down to close the switch. You find rocker switches on many power strips. Leaf switch: You press a lever or button to temporarily close this type of switch, which is commonly used in doorbells. Push on/push off buttons: Each press of the button reverses the position of the switch. Normally open (NO): This momentary switch is normally open (off), but if you hold down the button, the switch is closed (on). When you release the button, the switch becomes open again. This is also known as a push-to-make switch. Normally closed (NC): This momentary switch is normally closed (on), but if you hold down the button, the switch is open (off). When you release the button, the switch becomes closed again. This is also known as a push-to-break switch. Relay: A relay is an electrically controlled switch. If you apply a certain voltage to a relay, an electromagnet within pulls the switch lever (known as the armature) closed. You may hear talk of closing or opening the contacts of a relay’s coil. That’s just the term used to describe a relay’s switch.